Miami Trace junior Darby Tyree delivers a pitch against the Washington Blue Lions during an SCOL game at Miami Trace High School Wednesday, April 12, 2017. Tryee went the distance on the mound, notching a 2-0 victory for his team. 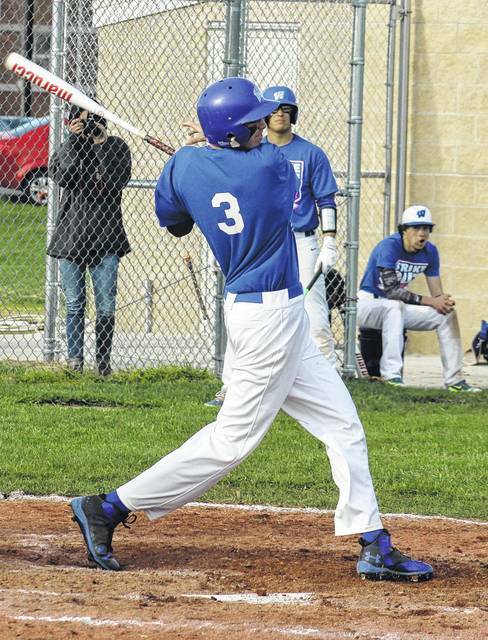 Washington Blue Lion senior Griffin Shaw takes a big swing at an offering during an SCOL game against the Panthers at Miami Trace High School Wednesday, April 12, 2017. When the Miami Trace and Washington High School baseball teams get together, more often than not it’s a close, exciting and competitive game and that was the case once again Wednesday when the Blue Lions traveled to Miami Trace High School to take on the Panthers in their first encounter of the season. True to form, the game was close throughout, this time with the Panthers coming out with a 2-0 victory. Darby Tryee pitched a complete game for the Panthers for the win. He allowed four hits with two walks and six strikeouts. He hit two batters. Jarett Patton worked six innings for the Blue Lions, taking the loss. He allowed four hits and two runs (one earned) with five walks and one strikeout. He hit three batters. The Panthers scored in the bottom of the first what would turn out to be the game-winning run. Josh Morton led off with a walk and Brady Wallace singled. With one out, Mitchell Creamer singled to load the bases. Skyler McDonald hit a deep fly ball to right field to score Morton to make it 1-0. The Panthers scored the game’s other run in the fifth inning. With one away, Wallace walked and stole second. Trenton Harris followed and was hit by a pitch. Creamer reached on an error that allowed Wallace to score. “I think that evens us up,” Miami Trace head coach Rob Smith said, speaking of the overall series between the Panthers and Blue Lions since he and Tyler Rhodus have been coaching their respective teams. “Every game has been within one or two runs,” Smith said. “It’s a great rivalry. Even though they’ve struggled, record-wise, they’re a pretty good baseball team. They played well tonight. They got out of a lot of jams. We left a lot of runners on. “Patton made the pitches and their position players made the plays,” Smith said. “It was a clean, well-played ballgame. 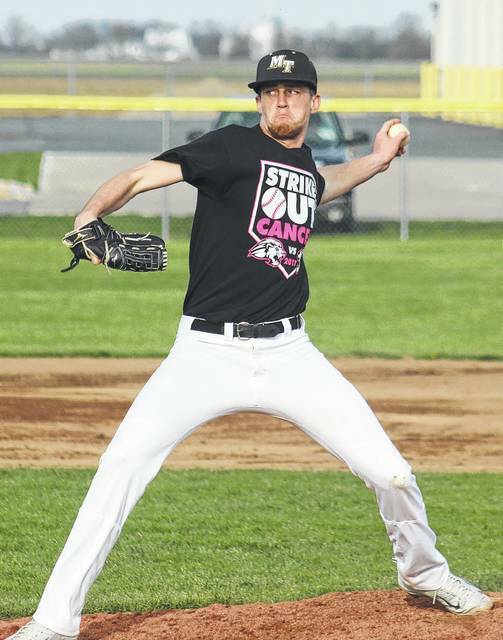 “Jarett was efficient with his pitches,” Washington head coach Tyler Rhodus said. “To his credit, he was in some jams; bases loaded with one out twice, maybe bases loaded and no outs, and he worked out of those. “I thought it was his best outing of the year,” Rhodus said. “For us, it was one of our better outings this year. We had good approaches at the plate. We were ahead in the count, we had a lot of hitter’s counts. “Darby throws well,” Rhodus said. “He’s deceptive. His pitches kind of sneak up on you. He has enough movement on his ball. Even in our hitter’s count, we struggled to really get out in front. We were still getting jammed. “I told my guys this was one of our better outings,” Rhodus said. “I thought we played well. Defensively, we did well. All around we played a pretty good game. That’s baseball. Sometimes you can play a really good game and still lose. “So, hat’s off to Trace,” Rhodus said. “They played well. They executed when they needed to. That’s where we missed out. They executed on two different plays and we did not on two different plays. That was the big difference in the game. “We had the bases loaded and two outs,” Rhodus said. “If we get a base hit, it’s a tie ballgame. “Rob and I have coached against each other enough in four years,” Rhodus said. “He knows my tendencies, I know his tendencies. He got the better of me tonight. I put a squeeze play on and he knew it was coming and had a pitch out and hung us out to dry. I told the guys, ‘that’s on me.’ That was early and would have changed the whole complexion of the game. I should have known better. That was a learning moment for me. Washington is 5-7 overall, 1-4 in the SCOL. The Blue Lions are at Unioto Thursday and at Clinton-Massie Friday. Miami Trace is now 7-2 overall, 4-2 in the SCOL. The Panthers are at Cedarville Thursday and home against Chillicothe Monday. Offensively for Miami Trace: Josh Morton, 0-2, 2 bb, 1 run; Brady Wallace, 1-3, 1 run, 1 bb, 1 sb; Trenton Harris, 1-3; Mitchell Creamer, 1-3, 1 rbi; Skyler McDonald, 0-2, 1 rbi, 1 bb, 1 sb; Logan Robinson, 0-3; Jacob Batson, 1-2; Austin Mathews, 0-2, 1 bb, 1 sb; Heath Cockerill, 0-2; Dalton Mayer, 0-0, hbp. Offensively for Washington: Conner Chrisman, 1-3, 1 bb; Ethan Marting, 0-3, 1 bb; Kenny Arboleda, 0-0, 1 bb; Jarett Patton, 1-3; Brian Wilson, 1-3, 1 sb; Nick Barrett, 0-2; Griffin Shaw, 1-3; Logan Jackson, 0-2; Kyler Mount, 0-1; Tyler Rood, 0-3; Elijah Ruth, 0-2; Christian Grove, 0-1. When Miami Trace plays at Washington High School on Monday, May 1, there will be a special pre-game ceremony on the field. The Blue Lions are going to honor the 2000 State championship team. “We’re trying to get as many of those guys to come back as possible,” Washington assistant coach Jeff Shaw said. Washington will also honor all six of the former players that were drafted into the Major Leagues. They will have their numbers posted on the outfield fence. Those six players are: Preston Bentley, Tim Redman, Jeff Shaw, Scott Lewis, Brad Stillings and Travis Shaw. Five of those players will be on hand for the ceremony. Travis Shaw will be playing with the Milwaukee Brewers that night in St. Louis against the Cardinals. There will also be a sign commemorating the 2000 State champions installed on the scoreboard. https://www.recordherald.com/wp-content/uploads/sites/27/2017/04/web1_Darby-Tyree-vs-Blue-Lion-baseball-4-12-2017.jpgMiami Trace junior Darby Tyree delivers a pitch against the Washington Blue Lions during an SCOL game at Miami Trace High School Wednesday, April 12, 2017. Tryee went the distance on the mound, notching a 2-0 victory for his team. https://www.recordherald.com/wp-content/uploads/sites/27/2017/04/web1_Griffin-Shaw-vs-MT-baseball-4-12-2017.jpgWashington Blue Lion senior Griffin Shaw takes a big swing at an offering during an SCOL game against the Panthers at Miami Trace High School Wednesday, April 12, 2017.